"I love the quality and the functionality of this wallet. It is just what I wanted." "The first day I used my Bryker-Hyde bag I received all sorts of compliments and inquiries. I guess it is not only I who thinks it is very attractive. What's more, everyone who commented noticed immediately its high quality. The only thing better than the bag itself is the company itself. I had one wee problem and they took care of it instantly and with the highest level of customer care/support. It is said you get what you pay for. With Bryker-Hyde I can say honestly you get more than what you pay for. So Now I have a great Messenger Bag. When I need my next wallet I will buy it from them. It will be the last wallet I ever need to buy. Their products are worth every penny and then some." "Sometimes the best products for women are only marketed to guys!! License, military ID, insurance cards, 3 credit cards, cash, 2 ‘emergency ‘ checks...all fit in a slim RFID package. This is great to slip in my jeans pocket when — as usual — I’m not carrying a purse. It’s also nice enough to tuck in my purse when I need to carry one or when I don’t have an available wallet pocket. Made in the USA. " "This is my second wallet. I loved my first one so much, that I wanted a second color. These wallets are exceptional and great quality. " 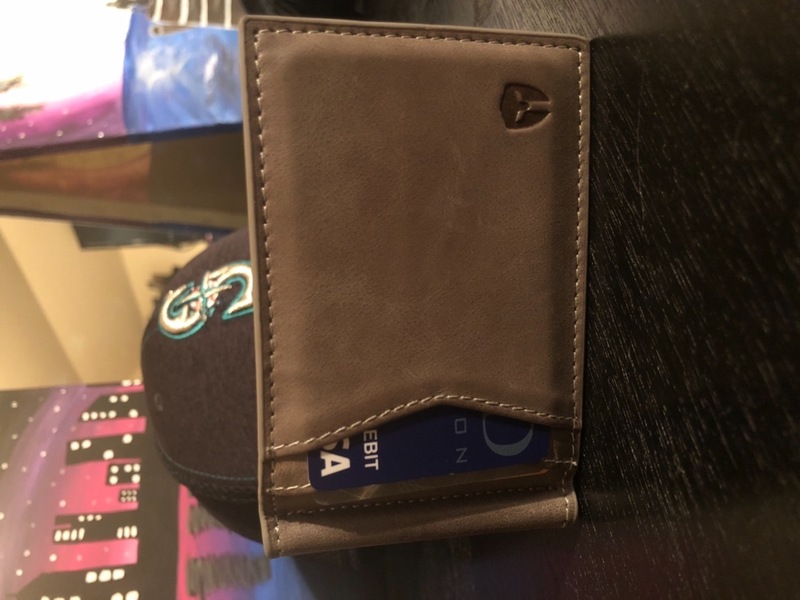 "I love that I was able to find a professional looking quality leather wallet that was both low profile and RFID blocking." "I love the style of it very unique , the billfold is almost too small to put bills in, I still Highly Recommend it." "Here is the response I sent to Bryker Hyde after receiving my wallet. "Received my wallet today. I love it! It looks great, feels great, and fit everything I needed/wanted to fit very nicely. Even the business cards that used to just float in the center of my last wallet now have a nice pocket. I've got my eye on one of your brief cases... keep up the great work guys!" The customer service has been fantastic and I truly appreciate their approach to growing their brand and value. They understand that building relationships is the key to building a financially viable, long-lasting business. It's clear to me that they are in this for the long haul and want to continue to develop and provide exceptional leather goods. They stand behind their products with a lifetime warranty and have earned my business going forward." "These wallets are top quality. I purchased these for my husband and both sons, and they all agree that they are the best wallets they have owned. Will definitely recommend this company to friends. " "Very nice wallet, a little thick but I carry an array of cards. I'm pleased with the wallet. " "Great experience. Fits easily in my front or back pockets. Easier to take out of my pocket and pay than a bifold. Gets thick when all the card slots are utilized but there's no getting around that." "So far so good. The last one had some problems after a year but I don't think I registered it. This new one is registered and I'm thinking it will be around for several years." "I've had it for a couple weeks now. It holds everything i need it to, which is around 8 cards. Plus a few other things and cash. Really like it so far"
"This is perfect for me. My old slim wallet didn’t have any type of money clip so I was always afraid of bills falling out. This solves that problem. It has a couple extra card slots than my other wallet had which is an added bonus. The leather feels nice, the stitching is good and I like the grey color. Thank you Bryker Hyde for making a quality product and supporting our Vetrans." "Keeps a ton of cards in my wallet, love the way the money is kept making it easier to order and access. " "Very nice wallet. Had a tri-fold before and hated it, this wallet has made it a much narrower profile. Money clip is nice, I really like that the money is clipped inside the wallet versus external clips. It fit all my cards from my old wallet, and it can hold a ton of bills inside the clip. Good quality." "My last wallet lasted at least 10 years and I rarely like change. But I found my old wallet was getting too thick and I wanted a slimmer wallet. This fit the bill and now I can keep my wallet in my front pants pocket or my front breast pocket without a ridiculous bulge. There are many wallets visually the same on sites like Amazon but this one is American made and the quality is impressive once I got my hands on it. I can tell it will last me 10 years and it won't go out of style. The stitching is fantastic and leather is high quality. I bought the distressed gray leather and I get compliments on the look. No regrets on the purchase and worth the price knowing this is my decade or longer wallet." "This is a great product. I'd been looking for a minimalist wallet that was still roomy and that looked good, and this fit the bill perfectly. Fantastic customer service as well -- all around recommended!" 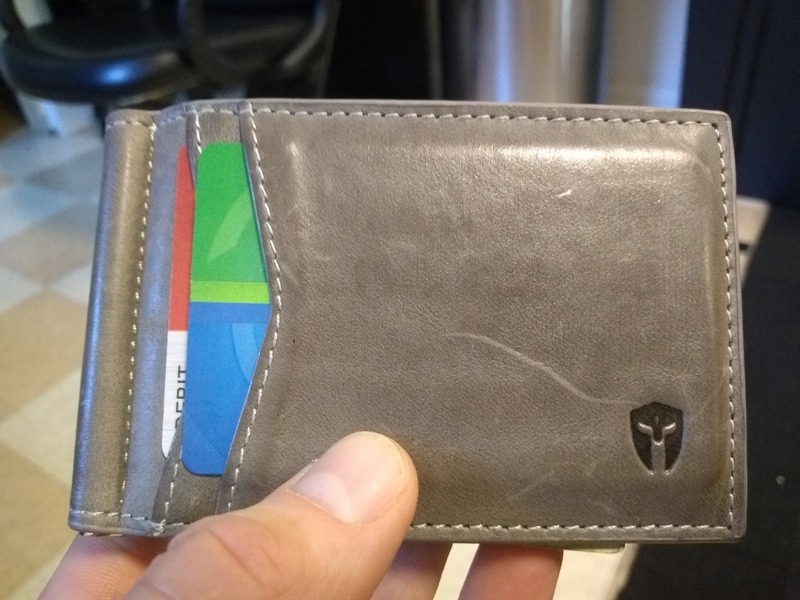 "I still have not received this item, so it’s impossible for me to write a review"
"Very pleased with product, fits enough cards and nice slim wallet for front pocket"
"Exactly the type of minimalist wallet that I was looking for." "The wallet is exactly as it is sold. Great minimal approach to a wallet. Quality leather and great functionality." "I ordered the slate grey wallet and absolutely love it! It literally cut my wallet size in half. The worksmanship and quality of the product is top notch. Quality product made in the USA!!! I will be ordering more products soon and can't wait for what products you guys come out with in the future!!!" "I bought the grey bifold wallet. I'm very pleased so far. The wallet is well-made, and at least for the month I've had it appears to be holding up well. The size and format are exactly what I needed for my (few) credit cards and ID cards. I especially like the zipper section, which is a fairly uncommon feature in comparable wallets." "As a veteran, I will always support small businesses that give back. Just the type of wallet I needed." "I have had my Quick Draw Bifold for about a week now so, I really can’t say how it will hold up. Thus far, it is holding up. I am very active and work construction, so durability is important. It looks great and isn’t bulky. I am satisfied. " "Love this wallet. Very handy with outside id and pockets. Very functional moneyclip. Holds alot and remains thin. It has become my go to. " "I have just begun to use the wallet but already find it very convenient to carry in my front pocket. Leather and stitching are fine; I chose the black nappa which is very soft. Wallet holds credit cards and cash securely but it is easy to withdraw them when needed. I have not yet traveled where the RFID feature is necessary but plan to use in on a trip to the Far East next year. Overall impression is of a high quality item." "I bought 2 of these for my husband and son. They are excellent quality and the design is perfect for the front pocket. Will order 2 more as gifts." "You have created a truly beautiful product - functional, incredibly well made and just gorgeous. I’ve carried it every day and it only looks better and better. Now a very loyal Bryker Hyde customer!" "The wallet is great and very efficient!"